Rapper has also become an investor in 'Smoooth payments' company. Snoop Dogg has partnered payment provider Klarna to become the unlikely face of its latest campaign, called "Get smoooth". The company, which offers buy-now-pay-later services, joined forces with the Drop it Like it's Hot rapper to bring its "Smoooth payments" motto to the next level. 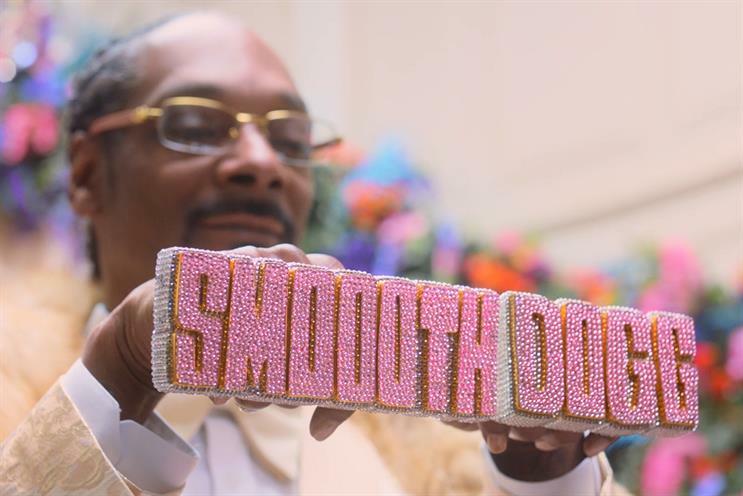 Klarna’s chief marketing officer, David Sandström, told Campaign: "We asked: ‘Can one of the smoothest people in the world be even smoother by using our product?’ Banks are seen as stiff and we’re trying to change that with Snoop Dogg. "His whole persona has been around entrepreneurship over the last two years, so it is a perfect match for us." In the first of a series of films by Nord DDB, which debuted today, a one-minute spot unveils the coronation of "Smoooth Dogg", with the musician being presented with a set of flashy knuckle-dusters emblazoned with his new name. Snoop Dogg can also be seen feeding his dogs a banquet of gold peanut butter and relaxing on his bed which he will "pay for later". The ad was created by Clara Uddman and Petter Swanberg at Nord DDB and the media agency is OMD. While working on the ads, Snoop Dogg (real name Calvin Broadus) grew increasingly fond of the banking brand – this "ended up with him investing" in Klarna as part of his European investment strategy. "I've been looking for an opportunity to expand my tech investment portfolio to Europe and seeing the way Klarna operates and how they challenge the status quo, I think it’s a match made in heaven. I’m very excited about this partnership," Snoop Dogg said. Sebastian Siemiatkowski, chief executive of Klarna, commented on the partnership on Twitter: "Snoop is not only a rap legend, but also a successful businessman, with a genuine interest in tech, retail and e-commerce. He has a great understanding of consumer behaviour and is exceptional when it comes to branding and marketing. "Teaming up with one of the smooothest persons alive opens new doors to Klarna as we grow and develop as a company,"
Following the "Get smoooth" campaign, Snoop Dogg and Klarna will reveal a range of items enabling anyone to "Get smoooth" in the next step in their collaboration.